In collaboration with FELIZ, we’re highlighting five of the designers who will be showcasing their wares at the biannual pop up market happening on December 9th. Get to know the makers and their journey with entrepreneurship before visiting them at the sale in December! 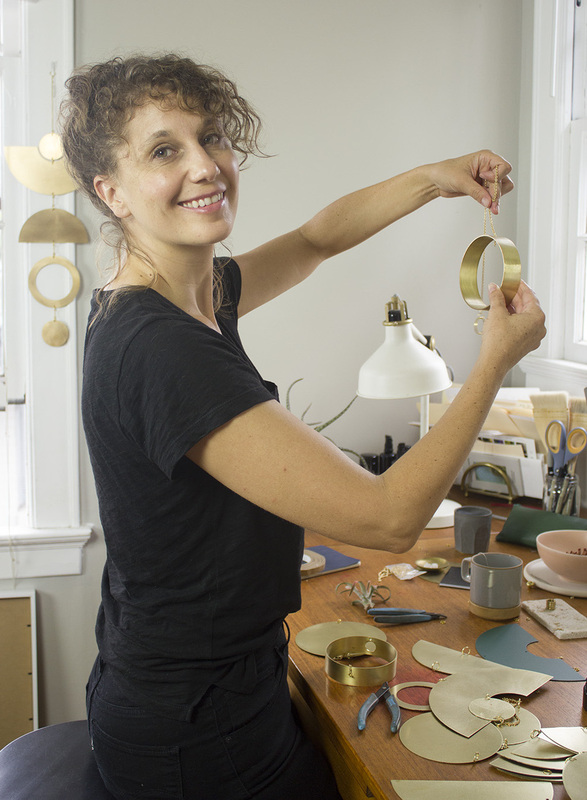 First up, meet Corie Humble of Circle and Line Design. 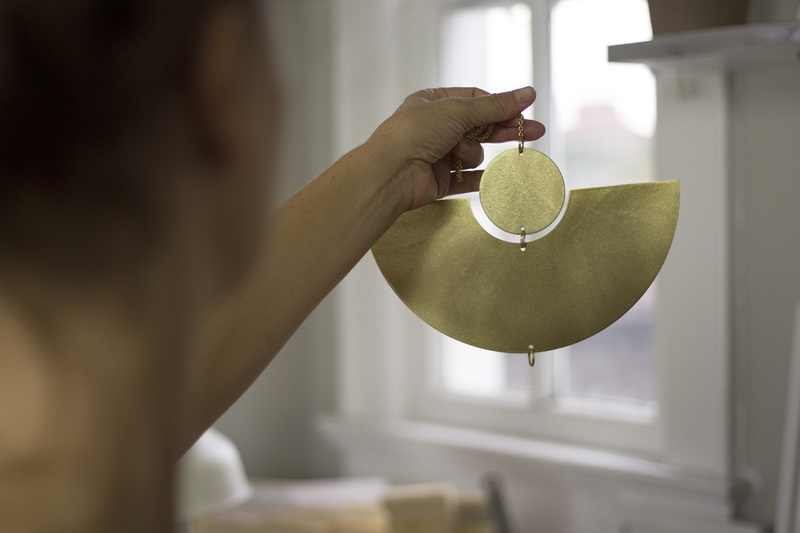 Corie took her background in leather accessory design and used it toward her current interior designs, which mainly take place in the form of mobiles. Below, learn a little bit about Corie’s design background, what she finds herself doing on a typical day, and her thoughts on owning a business. Tell us about your background. What were you doing before Circle & Line, and what led you to start the business? My background is in leather accessory design. 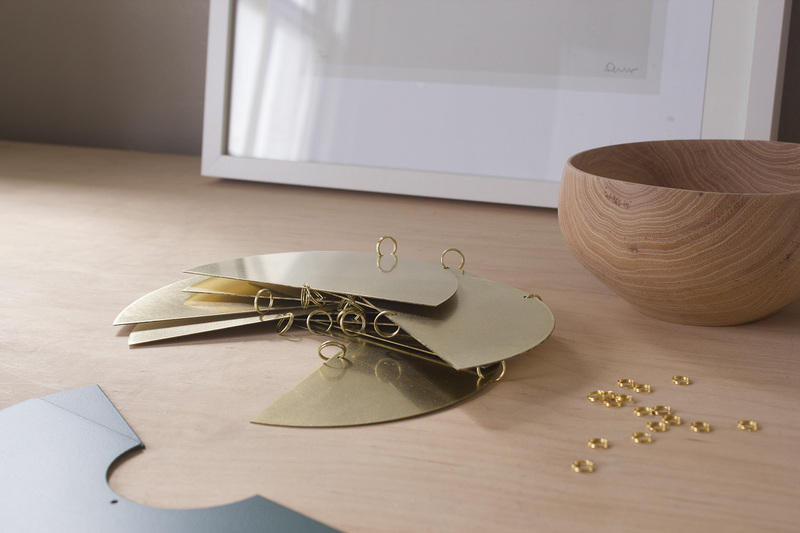 While working for Skagen designing small leather goods, I wanted to expand my design abilities to include jewelry. 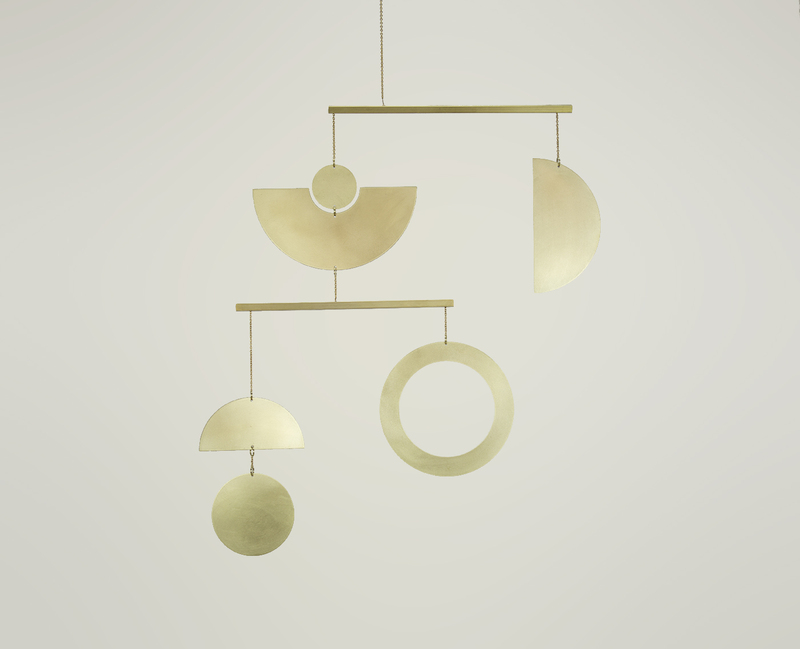 However, I quickly found the small scale of jewelry making a challenge and on a whim, I decided to make a mobile. After making the first mobile, I became a little obsessed by the magic of balancing parts and I had a stream of new ideas to pursue. In 2016, I left Skagen for freelance, continuing with leather accessory clients, but I kept making mobiles. 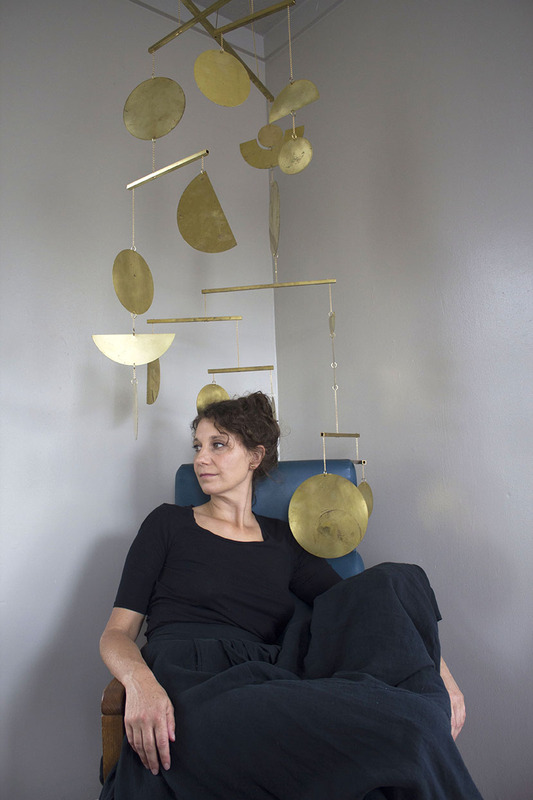 In the first year, flying solo, Anthropologie contacted me for an order and to customize the pieces to their brand, shortly after, The Citizenry contacted me to design and assemble pieces for them, collaborating with a Chilean Artisan, who cuts the parts. Although I still have leather design clients, I have found that unintentional success of the mobiles and home decor keeps me fairly busy. Reorders. As a hobby turned business, I am always surprised at any indication of success. I begin with computer work over coffee, and generally creative conversation with my partner, David Lovas. I work with a small production team of 3 people, currently all art students, which makes for finding some great drawings around our production space. We have a quick morning touch base. I have errands and suppliers to contact to make sure our production runs smoothly. By mid-morning to early afternoon, I have a chance to either design for clients or help with production in busy times. As an independent designer, where do you go for inspiration? What fuels your creativity? Pinterest. Kidding, (somewhat). I look at high-end furniture design and architecture from contemporary to historical. I am also inspired by traditional Korean and Japanese craft, which both have a very refined quality. If I am concepting, I generally look at a dizzying amount of visual stimulation, take a break, and sit down to sketch and see what resonated. I usually generate a lot of ideas and edit through them based on aesthetics and our abilities to execute. How do you think markets like FELIZ play a role in the small business community? If you’ve participated in FELIZ before, how have you grown with the sale? Feliz is a great springboard for small, creative product-based businesses to grow, build a community of design creatives, and for Austin to have a place to shop and connect to local designers and businesses. I find Feliz to have a high quality of vendors, who have fantastic products — it is inspiring to participate in the event. It is also great to meet other creative talent in Austin. Besides my production team, I work in a more isolated environment, and it is great to connect with other Austin creative talent. I am listening to Start Up Podcast, which is a cross between inspiration and a feeling of commiseration. A job pays more, and even if it feels stifling sometimes, it may be more creative than owning a business. Although, a creative business is a very rewarding experience despite low pay, long hours, and stress. If you still have the desire to run a business, take your time with setting a strong foundation from market research, mentors, collaborators, co-founders. The risk of failure is common, but even in failure, there is a tremendous amount of growth. The successes, no matter how small, feel more gratifying and give an amazing sense of accomplishment. Find Corie at FELIZ, happening December 9th at Palm Door on Sabine! You can also shop her designs at circleandlinedesign.com or keep up with her studio on Instagram at @circleandline_design.